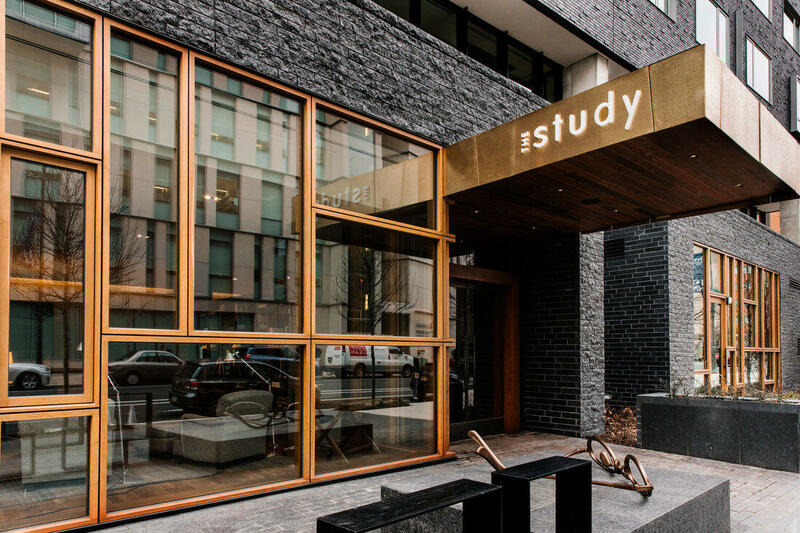 The Study At University City is the second property of Study Hotels, a lifestyle brand conceived around the needs of the university markets while offering high-quality, full-service lodging and dining. Located near the campuses of UPenn and Drexel University, we’re one of the best places to stay when seeking stylish comfort at an exceptional rate. 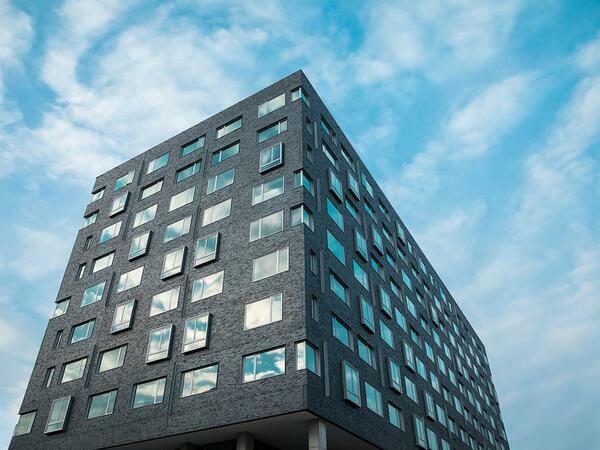 At both The Study at University City and The Study at Yale in New Haven, Connecticut, each hotel’s inspiration is taken from its location and the character of neighboring institutions. With thoughtful deliberation, our objective is to strike a balance between creativity, comfort and contemporary living. We seek to create inspired, uplifting environments that encourage positive social interactions. Every detail has been meticulously thought out to enhance the guest experience and create a sophisticated, yet relaxed environment. Our signature logo, a pair of reading glasses, is intended to elicit an emotional response from guests, whether it be reminiscing about a beloved piece of literature, or reflecting on one’s sense of quirky style, the glasses embody the essence of Study Hotels: Intellectual, Stylish, Restful yet not too serious. The Lobby/Living Room’s hallmark feature is a floor-to-ceiling bookcase showcasing a selection of admired literature, lifestyle publications and works by visiting authors. Our collections are constantly growing and evolving. Contemporary art also plays a dominant role in creating an environment that stimulates the senses and encourages creativity. Study Hotels are styled in a transitional contemporary motif, utilizing warm woods, stone, an eclectic mix of furniture with warm natural fabrics and whimsical accents. All spaces are designed for maximum comfort and functionality. Each guestroom features our signature leather reading chair and lamp which invite our guests to read, rest, and reflect during their stay and are appointed with high quality amenities including our signature seersucker robes and a generous work surface. The public spaces are designed to encourage relaxation, offering superb contemporary dining, great coffee, areas for quiet study and opportunities to socialize. Banquet and Meeting spaces are both intimate and functional, artfully furnished and equipped with the latest audio/visual equipment. State-of-the-art technology is evident with free wireless Internet connectivity offered throughout the hotel. All of these details and captivating moments enrich the guest experience and leave a lasting impression. Our focus on sustainability at The Study at University City impacts everything we do, from the selection of our food provisions, to our energy conservation and waste recycling, to our environmentally preferred operating and purchasing policies. We are fully committed to a culture that conserves its resources and a world that deserves vigilant care and respect. Hospitality 3 is a Manhattan-based real estate development company founded in 2003 by its Principal, Paul McGowan. The firm specializes in the positioning/repositioning of existing assets, and the development of new, ground-up projects for the hospitality industry. Drawing from more than 80 years of combined experience and over $2 billion in completed projects, the firm’s accomplished resources have the valuable insight, technical expertise, industry knowledge, brand strategy, and leadership skills to execute even the most challenging of projects. Paul is the Founder and Principal of Hospitality 3 LLC, a New Haven, CT and Manhattan-based real estate development services firm. He is also the creative mind behind The Study Hotels® brand, a concept conceived around its first two properties, The Study at Yale, a 124-room hotel operating on the Yale University campus and The Study at University City, a 212-room hotel in West Philadelphia’s University City. The Study at Yale has received numerous accolades, including Travel and Leisure’s “America’s Top College Hotels”, Yankee Magazine’s “Best Ivy League Stay”, and Connecticut Magazine’s “Best City Hotel in Connecticut” for the 4th consecutive year. The company is currently in the planning stages for its 3rd and 4th properties located on prominent, east coast campuses.